Special thanks: Michael Schetlick, RETROSolar. 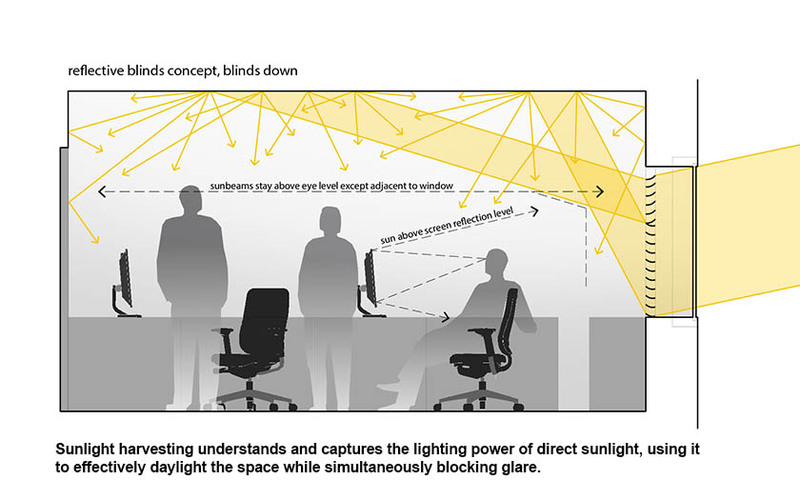 “Sunlight harvesting” is the technique of using reflected direct sunlight for daylighting. 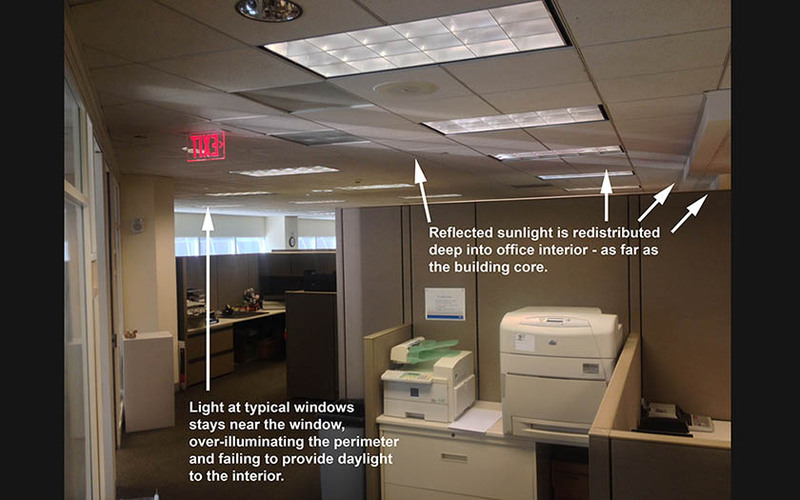 Typical commercial building design ignores the sun, and conventional lighting design follows in step, addressing direct sunlight as a problem to be shut out. 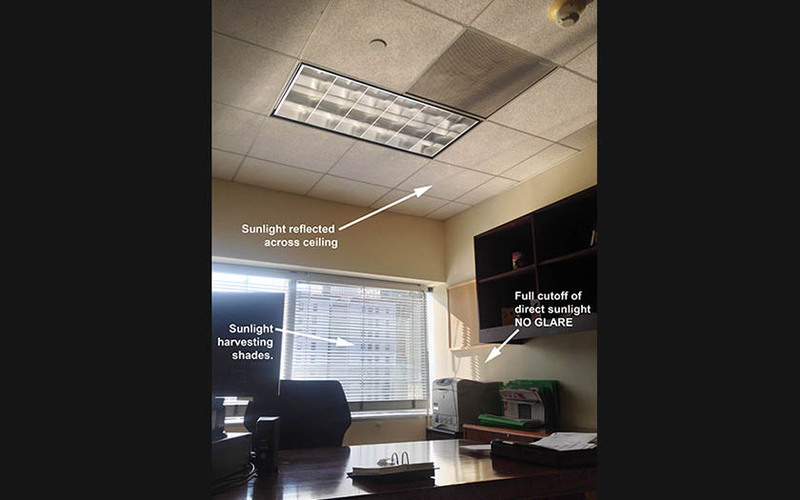 Sunlight harvesting instead understands and seeks out the immense lighting power of direct sun and – with surprisingly simple means – puts it to effective use, simultaneously reducing energy use and creating more pleasant and productive workspaces. 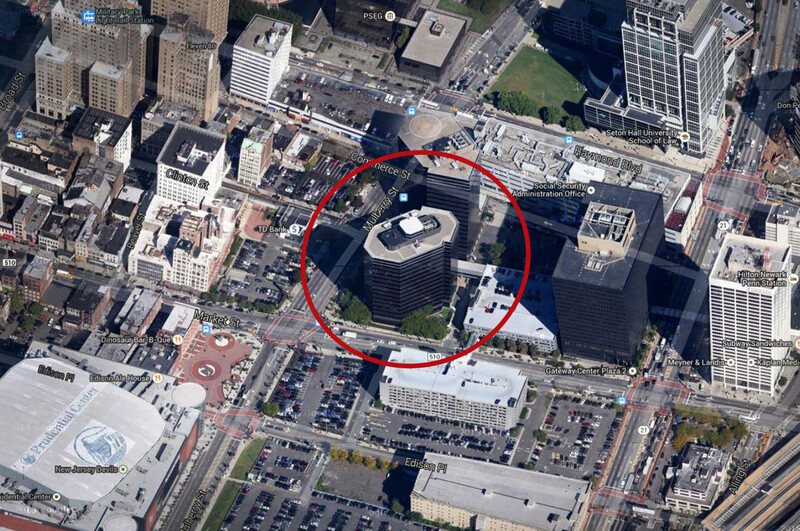 The technique has great potential to re-shape both the experience and energy footprint of commercial buildings like offices and schools, where lighting (and its resulting waste heat) are often the largest energy users. Yet despite strong precedent in work completed through the 1970’s and 80’s the practice is unknown in contemporary domestic construction. Towards the end of re-introducing this body of knowledge, in collaboration with facilities managers and blinds manufacturers, I have undertaken a series of demonstration projects in real-world settings. The method is simple. 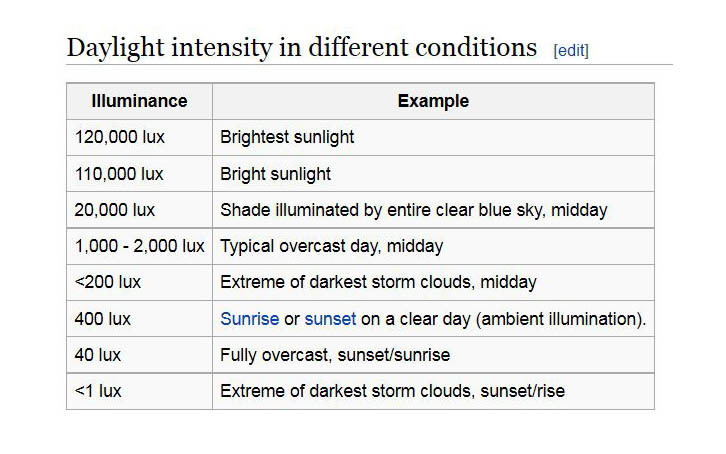 Direct sunlight contains an order of magnitude more visible light than that emitted from the open sky. Anyone who sits at a desk under even a modest sunbeam understands this all too well. 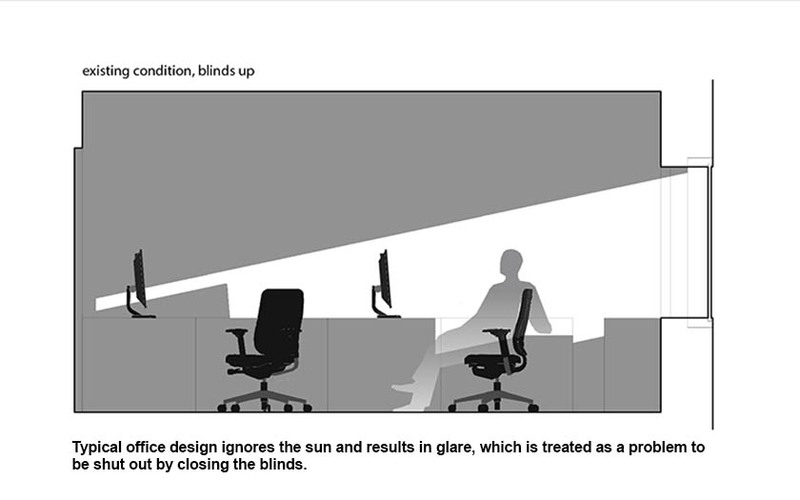 It is too bright, and to make the workspace usable the blinds must be lowered, ironically forcing the use of artificial lighting. Sunlight harvesting places reflectors at the window to catch the sunlight and direct it upward and inward. This shades glare and redirects all that intense lighting power to the ceiling, where it spreads out evenly, just as an overhead light does. 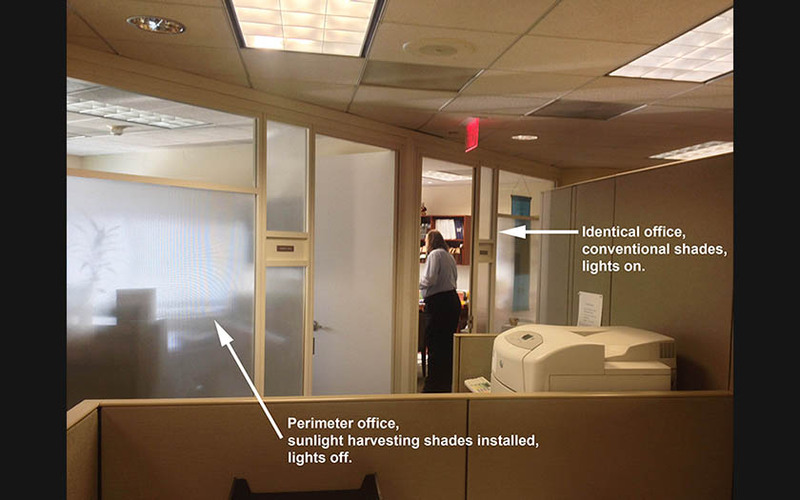 Utilizing mirrored reflecting surfaces provides unusually deep transportation of the light into the typically unlit office interior – think of the distance one can reflect a beam of sunlight using a hand-held mirror, in contrast to what is possible with a sheet of white paper. 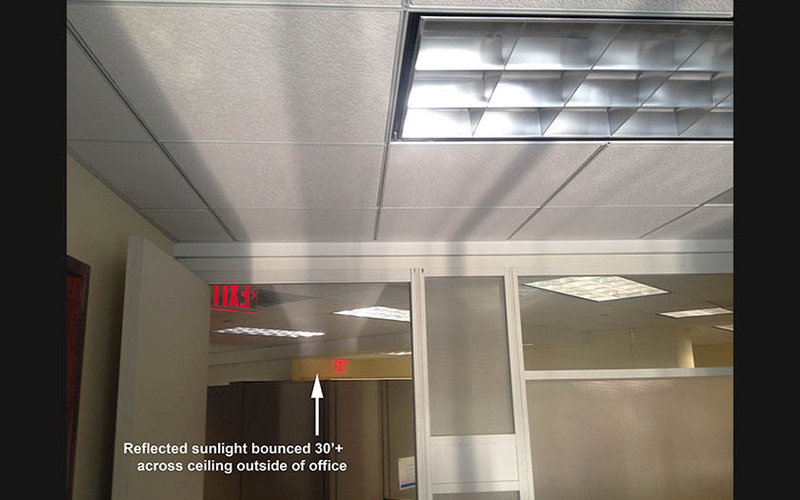 These reflectors can take a number of forms, applied to either the interior or exterior of the building, including lightshelves, fixed or adjustable louvers, and even micro-prismatic adhesive films. They need to be chosen and arranged in response to a window’s size and shape, its relationship to the sun, and its relation to the room within. One of the most interesting is a simple polished aluminum venetian blind with upturned slats. These blinds provide the benefits above without the cost or disturbance of more elaborate construction, and come in a familiar-to-use package. 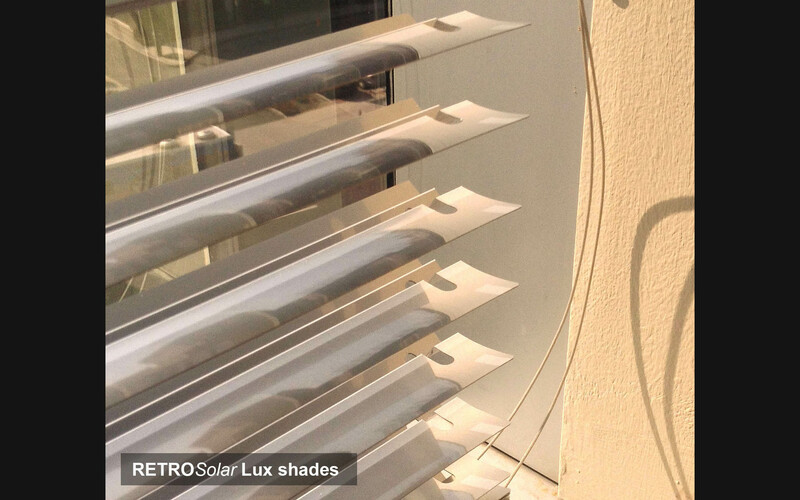 They are utilized in this study, provided by the manufacturer RETROSolar, installed as a simple retrofit of the building’s existing venetian blinds. In order to encompass the full range of annual sun angles, this demonstration includes both south-facing and west-facing rooms. 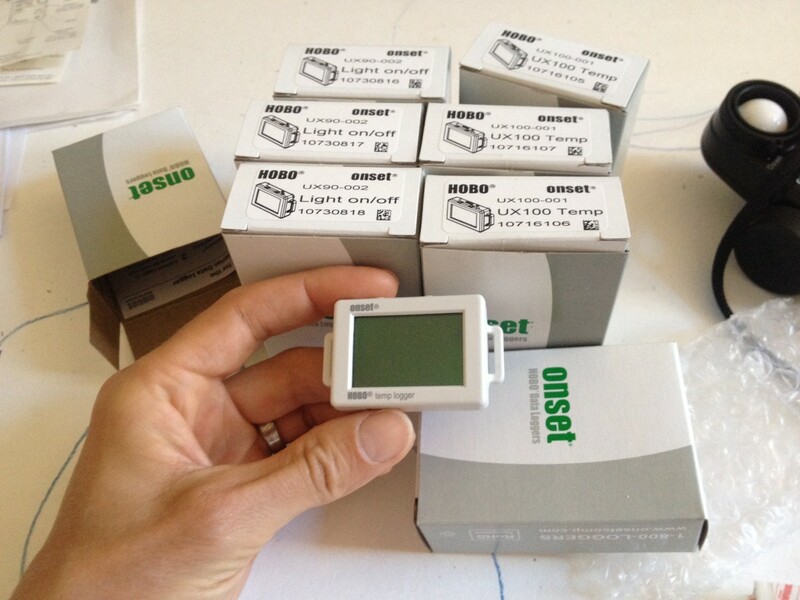 Data logging is in place to accompany occupant interviews and provide numerical backup for anecdotal information regarding reductions overheating and glare.